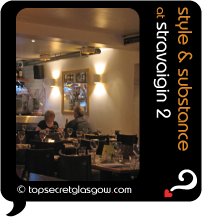 Stravaigin 2, happily bright and breezy on Ruthven Lane, can be spotted from Byres Road. Wholesome nosh gives us Scottish and world-wide choices is the name of the game here. Possibly the best burgers in Glasgow are to be found in right here. Ever thought of having a Wild Boar Burger? Well, now is your chance! Or you could push the boat (and your waist line) out by adding it to a beef burger and a Thai chicken burger Ã¢â‚¬â€œ all in one serving. A happy member of a small family of quality eateries, and a real member of the 'best of the West End' clan, this place remains as much fun as ever, in its cosy little nook. Great news! Finding this page means you can now join our VIP list for Stravaigin 2. Grab your very own web page all about Stravaigin 2. Do you have a special story about Stravaigin 2? A funny experience? A grand occasion? A funky photo? A personal tip? A top secret?